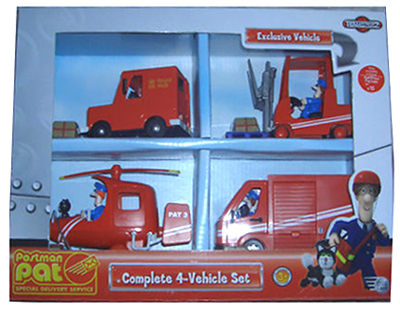 This multi-vehicle set released December 2010 includes the original Pat 1, Pat 2 (larger SDS eco-van), Pat 3 (helicopter) and exclusive first release vehicle Postman Pat’s Forklift Truck. This vehicle set has the first release of the Postman Pat Forklift. The forklift comes with a pallet and parcel; the forks can be moved up and down. Pat’s new forklift is in classic red with the white SDS decals. Each vehicle has opening doors, sound effects, a Postman Pat figure and each comes with an SDS parcel to deliver.